Dining is not only a feast for the taste-buds. It is a multi sensory experience, which when expertly crafted has the power to remind you of the favourite tastes of your childhood. This is why here at Prestige Suite, cooking is entered into with abandon. Boneless chicken breast pieces cooked with traditional pickling spices. Spicy South Indian deep fried chicken breast flavoured with various herbs & spices. Tandoor or oven baked chicken drumsticks available in many mouth-watering flavours including Piri Piri, BBQ & traditional Tandoori style. Tender pieces of chicken breast pan fried in a light batter and then stir-fried in a sweet & sour marinade infused with sautéed ginger, garlic, spring onion, onion, peppers and soy sauce. Traditional dish where tender pieces of chicken breast are marinated in yoghurt and seasoned with herbs & spices then baked in a tandoor/combi oven before being finished off in a light masala sauce. Boneless chicken breast marinated with spicy corn flour batter, deep fried and tossed with onion, chilli, ginger, garlic, peppers and soya sauce. Boneless chicken breast pieces tossed with cumin seeds and Indian spices. Tender chicken breast pieces marinated with fresh fenugreek, herbs and spices and yoghurt before then being baked in a tandoor/combi oven. Succulent chicken breast baked to perfection in a creamy herb and spice infused yoghurt. 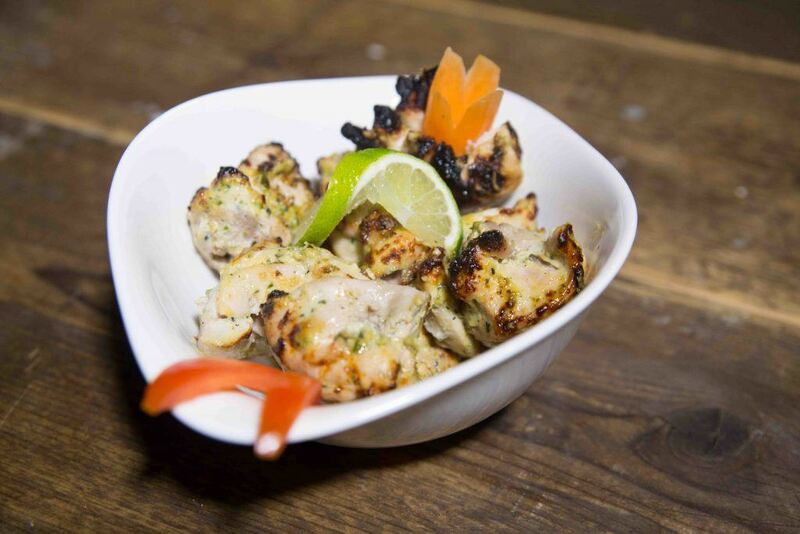 Succulent boneless chicken breast, marinated overnight in yoghurt, ginger, garlic, herbs and spices. A traditional classic. Loosely cooked mince lamb tossed together with ginger, garlic, onion, tomato, coriander and blended with its key ingredient garden green peas. Lamb cooked in typical Punjabi style with onions, tomatoes, green pepper and herbs and spices. Lamb chops marinated in ginger-garlic, yoghurt, herbs and spices. Cooked to perfection. Delicious lamb patties infused with mint, fresh coriander & a hint of spice then grilled to perfection. 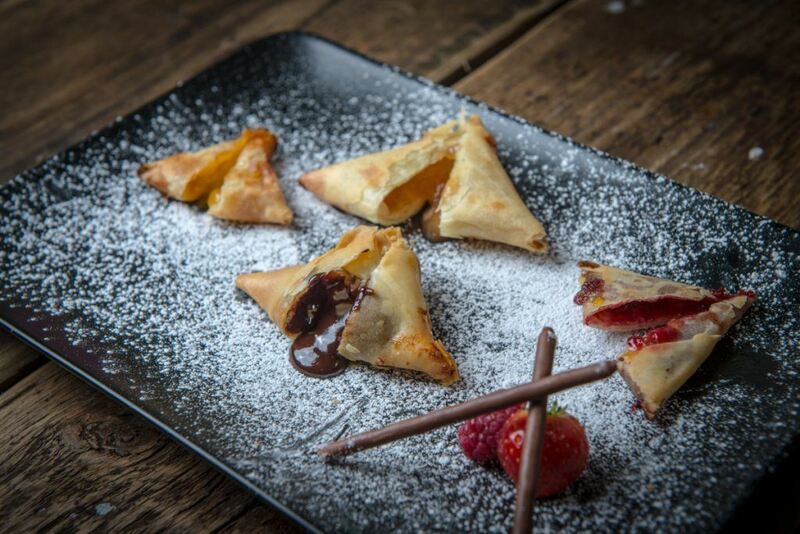 Triangular shaped filo pastry stuffed with mince lamb and deep fried. Minced lamb infused with fresh coriander and a hint of spice. Grilled to perfection on a skewer. Battered cod fillets pan fried and sautéed with onions, garlic, ginger, peppers, green chillies, and spring onion tossed together in soy sauce. Boneless cod pieces marinated in a spicy batter and deep fried until golden. King Prawns cooked with red chillies in a spicy onion and tomato gravy. Boneless cod pieces marinated with special herbs and spices in a batter and deep fried. King Prawns marinated in a crispy tangy batter and then deep fried until golden. Authentic lightly spiced fried potato cakes. Spicy tangy chickpeas cooked in an olive oil base with light onion and tomato sauce. Jalapeño & soft cheese nuggets encased in a golden batter. Lightly fried cassava with our head chefs spices. Indo-oriental style of tossed Indian cottage cheese (paneer), onion, green chillies and green and red peppers in a tangy sauce. Filo pastry triangles stuffed with potato, vegetables and spices. Crispy, flaky shells with a delicately spicy filling of cooked and seasoned yellow moong daal. Delicious deep fried florets of cauliflower marinated in our head chef’s special batter. Fresh cauliflower florets coated in a lightly seasoned crisp golden batter. A pancake shaped kebab consisting of fresh spinach, potatoes, green peas, coriander and spices – deep fried. Something for the kids, and the adults too, eastern twist on a western favourite. Fried Cassava chunks in a chopped onion, capsicum, green chilli, leek, spring onion sauce tossed with garlic and ginger. Fried mushrooms in a chopped onion, capsicum, green chilli, leek, spring onion sauce tossed with garlic and ginger. Batter fried paneer in a chopped onion, capsicum, green chilli, leek, spring onion sauce tossed with garlic and ginger. 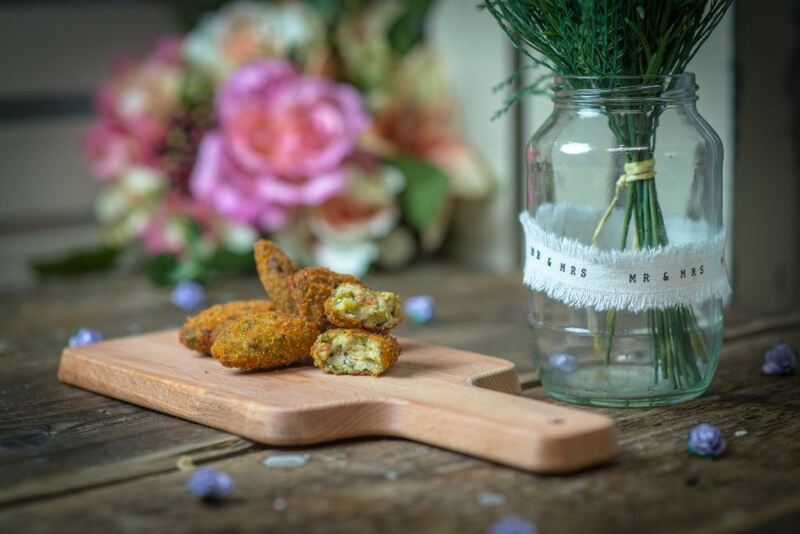 Indian fresh cottage cheese cubes stuffed with spices and deep fried in a spicy gram flour batter. Finger shaped spring rolls filled with a mixture of cottage cheese, green peas, sweetcorn, green chillies, coriander and spices. Home-made Indian cottage cheese, cubed and marinated with yoghurt, ginger, garlic, onion, green and red pepper, tomatoes, red chillies and spices, then cooked in the tandoor. Delectable deep fried pastry filled with a spicy green pea mixture. 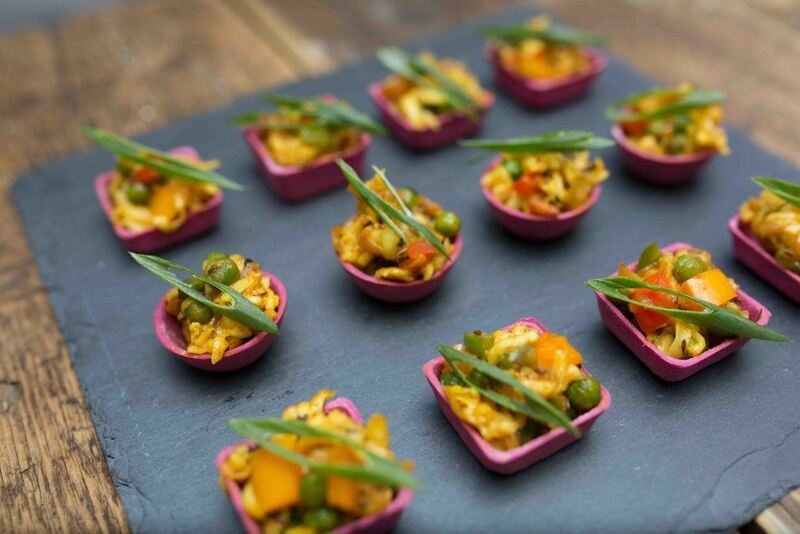 Closed cup mushrooms stuffed with potato, paneer, vegetables and herbs & spices. Breadcrumb coated patties with potato & spicy mix vegetables. Breadcrumb coated finger sized kebabs consisting of potato, mixed vegetables, soya mince and spices. An assortment of mixed vegetables wrapped in crispy filo pastry, a pleasure on the eye and the stomach. Fresh green vegetables stir fried with garlic, ginger, onions, cabbage and peppers in soy sauce, delicious spicy or mild. Traditional Punjabi recipe of potato, spices, spinach and onions mixed into gram flour batter, deep fried. Traditional Punjabi recipe of potato, green peas, mixed vegetables and onions mixed into gram flour batter, deep fried and triangular in shape. Finger shaped filo pastry filled with a mixture of capsicum, carrots, cabbage, green chillies, coriander and spices. Classical chicken tikka in a succulent tomato and buttery cream gravy. Flavoured with dry fenugreek leaves. Basmati rice cooked with chicken and roasted whole spices. Boneless chicken thigh pieces cooked in a delicious tomato-onion based gravy with spices. Chicken tikka with bell peppers in an onion and tomato gravy, spiced with garam masala. Tender chicken, marinated in yoghurt and spices, cooked to silky succulence in the tandoor, then simmered in a vibrant-red masala sauce. Curry leaf flavoured chicken dumplings simmered in mildly-spiced sauce, with a hint of green cardamom and fenugreek. Succulent chicken pieces cooked in a broth with basmati rice, until rich and fluffy. Tender pieces of chicken thigh cooked in a Punjabi sauce infused with fresh green peppers & onions. Succulent chicken pieces cooked with garden fresh spinach. Minced Lamb and green peas (mutter) seasoned with cardamom and flavoured with fenugreek leaves cooked in traditional style. Boneless lamb cooked with a ginger – onion – garlic paste in a rich tomato gravy. Tender pieces of lamb marinated overnight with herbs and spices, cooked to an age old recipe using basmati rice. Succulent pieces of lamb cooked in a spice infused tomato and onion base masala gravy. 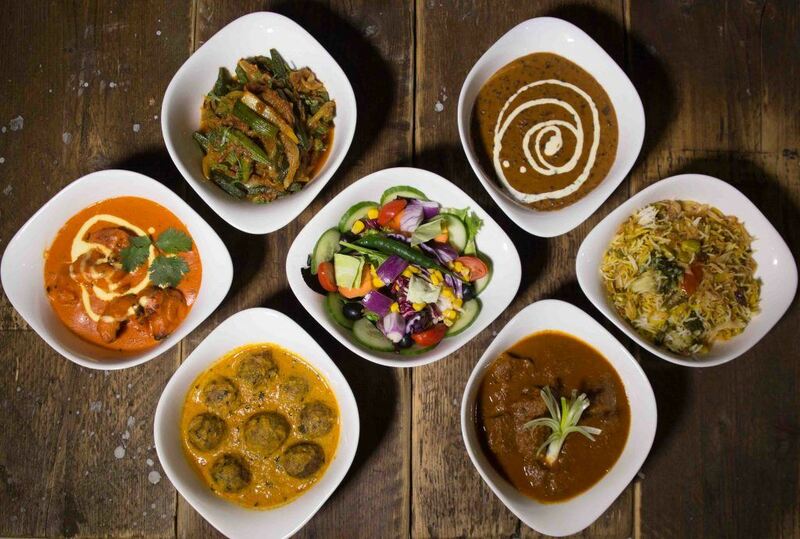 Kofta balls made from minced meat, coriander and chana powder cooked in a spicy onion and tomato gravy. Tender pieces of lamb, cooked in a broth with basmati rice, until rich and fluffy. Tender pieces of Lamb, cooked with fresh ground roasted spices, onions and the key ingredient an abundance of tomatoes. Lamb cooked in savoury spices and finished with garden fresh spinach. South Indian inspired fish curry made with tender cod fish pieces in a delicious tamarind & curry leaf sauce. An exotic preparation of king prawns, cooked in a rich masala gravy with its blend of spices. Aubergine and potatoes cooked with traditional Punjabi tarka using olive oil. Potatoes and chickpeas cooked with traditional Punjabi tarka using olive oil. Cauliflower and potatoes slow cooked in a masala tarka. Potatoes and fresh green peas in a light runny gravy. A delicate spinach based dish cooked with pan fried potatoes. Fresh okra sautéed with dry-roasted spices in a light onion and tomato Punjabi tarka. Spicy tangy chickpeas cooked in a masala gravy. 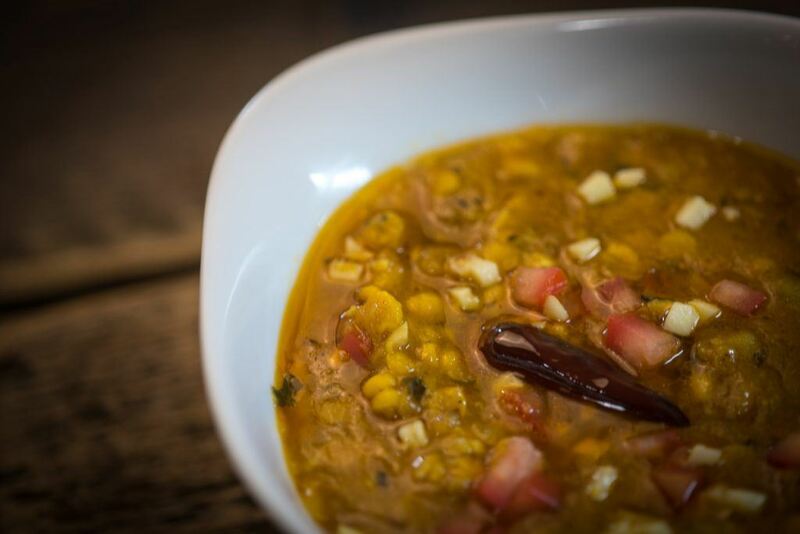 Traditional yellow lentil (channa) flavoured with crisply-fried garlic, onion (the tarka), tomatoes, red chillies and cumin. Black urid lentils and kidney beans, stirred over a slow fire for many hour with spices, tomatoes, cream & butter, until creamy and irresistible. Potatoes slowly cooked in a light onion and tomato masala seasoned with mustard seeds and whole red chillies. 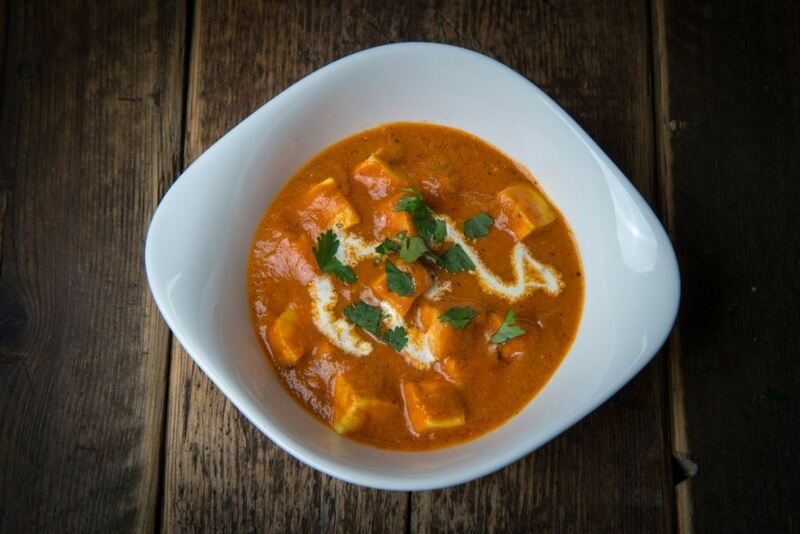 Paneer cooked in a rich gravy with tomatoes, butter and cream, flavoured with spices. Dumplings of fresh cottage cheese in a rich creamy gravy. Delicious curry of peas, homemade cheese cubes and spices cooked with fresh and dry fenugreek. Silky spinach dish delicately cooked & infused with chickpeas. Home-made Indian cottage cheese simmered in light spicing and garden fresh spinach. Batons of Indian cottage cheese, mixed peppers and onions cooked in a masala sauce, flavoured with fresh coriander. Traditional Punjabi style Saag, a delight for the senses. Homemade cottage cheese cubes cooked with cream, tomatoes, spices and cashew nuts. A lovely blend of vegetables cooked in authentic Indian style. (soya, Gobi, onions, mushroom, baby potatoes and baby corn. Baby aubergine individually stuffed with traditional herbs & spices. Tempered lentils (Toor daal) forming a delicious thick textured soup. Flavoured with crisply-fried garlic, onion (the tarka), tomatoes, red chillies and cumin. A lovely array of sautéed fresh vegetables cooked in a traditional masala tarka. Served sizzling. Indian baby pumpkin sliced up and slowly cooked in a rich traditional punjabi tarka. Vegetables and basmati rice cooked with roasted whole spices. Mixed vegetable dumplings, deep fried served in an onion, tomato, ginger and garlic masala sauce. Delicious combination of vegetables cooked in a rich creamy gravy with spices. 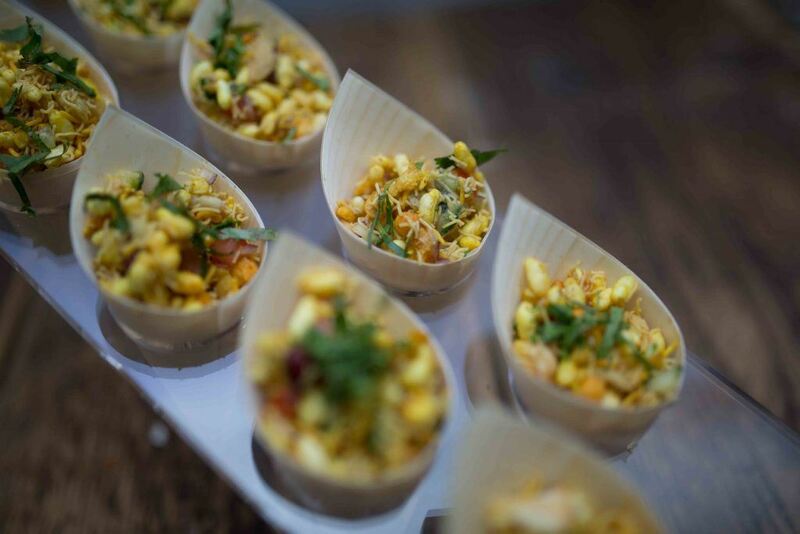 Good food is the corner stone of any successful event. Prepared on site, with flair and great innovation, each dish is elegantly created to provide you with a unique taste of the East. Allow your guests to indulge in the unique opulence of Prestige Suite, where passionate flavours and an extraordinary level of service aim to cater for your every whim. Delicately spiced potato pancake topped with chickpeas, chopped onions, carrots, coriander, mint and tangy tamarind chutney. A nourishing and wholesome drink made from almonds & milk and delicately flavored with cardamom, served cold. Delectable combination of onions, puffed rice, sev, potatoes, chopped tomatoes, mustard oil, green chilies, black salt, potatoes, coriander, peanuts and lemon juice. A novel way to enjoy some decadence. Hot and creamy chocolate fondue served from a multiple tier fountain over a large heated basin. A wide selection of fresh tropical fruit beautifully presented in a chic martini glass or artificial boats. A refreshing tropical fruit cocktail drink served in champagne glasses with a strawberry on the rim. An assortment of tropical fruit displayed in an original and quirky manner. Small round hollow semolina crisp balls filled with a mixture of spicy tamarind water, coriander leaves, potato and chickpeas. A cold refreshing beverage prepared by blending yogurt (Bio pot) with water and adding sugar and other spices to taste. A twist on the original, prepared by blending yogurt (Bio pot), water and mango pulp. It may be made with or without additional sugar. Served ice cold. More like a pancake and not as crisp as a dosa, made from fermented batter of urad dal and rice. Traditionally made with toppings such as tomatoes, onion, green chillies, capsicum and coriander (varieties available). Authentic Chinese style noodle station serving freshly prepared noodles as per your specification. Deliciously savoury or sweet popcorn or go for a more bespoke variety of flavours. Thin and crispy snack made from urad dal flour and rice flour and deep fried. A selection of nuts deep fried on site mixed in with a selection of our chefs own spices. Vegetable samosa served with flavoursome potato & chick peas infused yoghurt topped off with sweet tamarind chutney & finely chopped onions, carrots and coriander. Another twist, flavoured with sugar, rosewater and/or lemon, strawberry or other fruit juices. Choice of potato, onion, cauliflower, green chillies or aubergine deep fried with a spicy gram flour batter. Traditional thin unleavened flatbread made from whole wheat. Crispy whole wheat layered flat bread, perfect accompanying any gravy based dish. Traditional unleavened Indian bread made from corn mela flour, baked on a tava. Perfect with Sarason Ka Saag. Indian bread made with a combination of wheat flour and gram flour and seasoned with spices. Popular unleavened flatbread made by pan frying whole wheat dough on a tava. Similar to Bhatura but made from unleavened whole wheat flour. Classic Indian unleavened Tandoori bread cooked in a clay oven and brushed with butter. Whole wheat flour bread cooked traditionally in a clay oven. Basmati rice flavoured with cumin seeds and cooked with chopped onions. Basmati rice flavoured with cumin seeds and cooked with green peas, mixed vegetables and soya. Rich and fluffy basmati rice cooked in a broth, flavoured with cumin seeds and cooked with onions and green peas. Basmati rice seasoned with saffron. Deep fried balls of urad dal, spiced, soaked and served in yoghurt. Yoghurt infused with gram flour balls & flavoured with dry roasted cumin. Yoghurt infused with grated cucumber and dry roasted cumin. Yogurt made with chopped onion, tomato & capsicum and a mixture of herbs & spices. Yoghurt with chopped onion, tomatoes, cucumber and carrots. Yoghurt with onion and cucumber. A chopped mixed salad full of surprises. An assortment of vegetables beautifully presented. Traditional luxury Indian ice cream infused with almonds. Rich creamy fudge like sweet dish. Choose from almond, plain, pistachio or coconut. 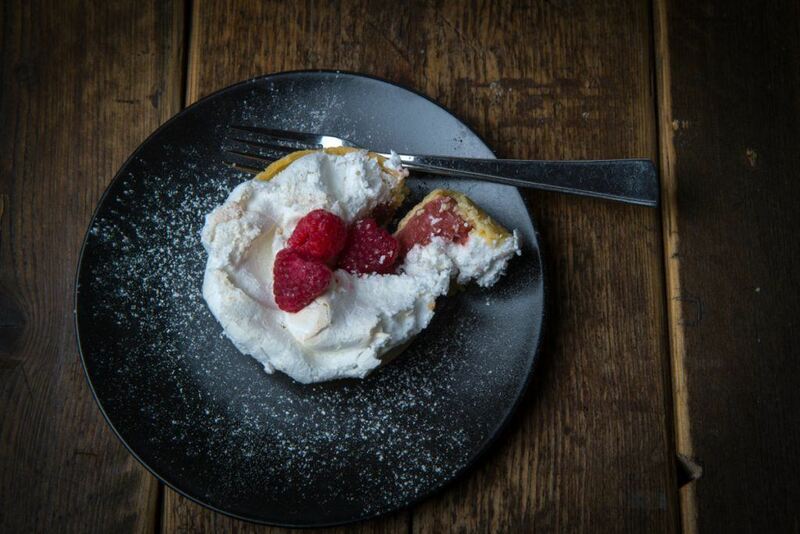 Soft fresh cream cheese infused with white chocolate and raspberry on a biscuit base. Coconut rice pudding dish made with whole milk, sugar, cardamom, coconut flakes, raisins, sliced almonds. Served warm. Cold sweet ‘milk shake’ like beverage comprising of ravri (creamy milk) mixed with vermicelli, rose syrup & crushed ice with vanilla ice cream. Fresh carrots cooked in milk and ghee and garnished with nuts. Served Warm with Kulfi. Deep fried milk cake dumplings in a sugar syrup served warm with Kulfi. Batter of flour and milk deep fried into golden, curly crisp rings soaked in sugar syrup. Traditional luxury Indian ice cream with a hint of mango. Combination of exotic and non-exotic fruits. A rich sweet dish made from lentils caramelised using butter, sugar and fresh cream. Mini cake selection including Chocolate Éclairs, Profiteroles, Cheesecakes, Tiramisu, etc. Luxury Indian pistachio ice cream. Sweet white paneer balls served with a flavoured cold syrup. Dessert in its purest form, fluffy light sponge cake, in a creamy milk syrup base. Served cold and dressed with crushed pistachios. Prestige Suite takes on a classic but adds a twist with a unique stuffing. A visual delight, a hollowed out pineapple husk filled with rich, creamy pineapple infused vanilla ice cream. 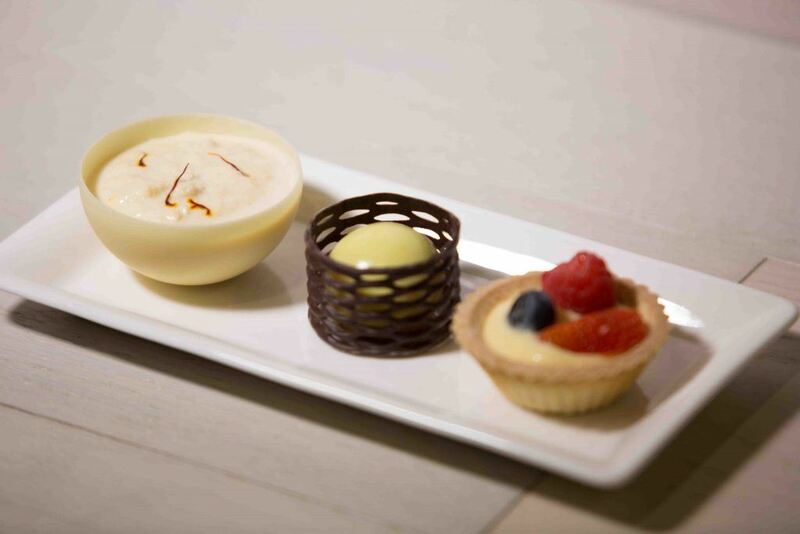 Prestige Suite takes on a classic but adds a twist, infused with Saffron with a rich creamy yellow milk syrup base. Traditional luxury Indian ice cream with a hint of vanilla. Traditional sweet rice dish, flavoured with saffron and dry fruits. guests with their incredible innovation and visual wow factor. Please download our mouth watering menus. Something for everyone and for all events and occasions. Birmingham’s best kept secret for Authentic Indian Event Catering. we have the passion and professionalism to impress. Click here to find out more. Please note if you contact Prestige Suite on a FRIDAY or a WEEKEND date we may not be able to respond back until MONDAY due to running events. Appreciate the patience. I confirm Prestige Suite may hold the above data for contact purposes and marketing promotions.